Well, writing some thing of praise for this man is like showing light to the sun. i would describe him as the closest approximation of the perfection in an art.__Muneeb Shaukat Khan. well, writing some words of praise for this man is not the easiest of things to do. it is like showing light to the sun. 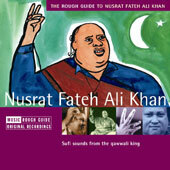 the great nusrat fateh ali khan is the only singer i would say , whose work in music is for every one. he is not a class bound artiste. he is for ever.